2.11m long by 12.5cms wide * 5.5cms high. Weight is 10.9kgs. The SG X Series pull up screen features a Slimline case design providing a lightweight and mobile solution for professional presentations. The screen utilises the proven single pole system. The pole is easily clipped into place to support the screen and then stored away afterwards in the smart case. The high quality screen surface is optimised for the latest projector technologies. 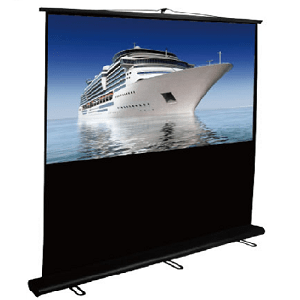 This wide format 16:9 screen is perfect for home theatre use in medium/large rooms in conjunction with any wide format data projector. A screen carry case (see below) is recommended where the screen is frequently transported. For heavy use we recommend the SG 600 Series of premium pull-up screens. This screen is a suitable size for transport in some large cars or in larger vehicles. The screen surface is matt White (Matt white according to DIN 19045 Type D) with black border and has a lightproof black back. The material is mildew-resistant. The screen has a gain factor of 1.2. A black leader approximately 350mm high allows the viewable screen surface to be raised to a suitable viewing height. The screen features a heavy duty, scratch-resistant metal case in black.